Everyone knows that snacking can play an important role into maintaining a healthy weight. Choosing healthy, low-calorie snack options over sugar laden or fatty traditional snacks can make a huge difference on your healthy and weight. In need of healthy snacks ideas? Here are some suggestions. Pop corn: Top air-popped pop corn with a bit of olive oil and salt, or mix your own pop corn favoring by mixing salt, nutritional yeast, smoked paprika and onion powder. Hummus with crackers and raw veggies: Home made or store-bought hummus with whole grains crackers and chopped raw veggies makes a delicious and healthy snack that will sustain you for the whole afternoon. Peanut butter apples: Spread some natural peanut butter on apple slices for a quick healthy snack. Mixed nuts: a handful of mixed nuts are a real quick fix for a snack attack. Rich in omega-3, protein and minerals, mixed nuts is also a good way to support your health. Pretzels twists: If you must indulge in classic store-bought snacks, choose pretzels. Pretzels contain much less fat that potato chips or corn chips. Yogurt parfait: If you’re in for a sweet treat, layering fresh fruits, yogurt (dairy or non-dairy), and granola with a drizzle of honey of maple syrup makes a healthy sweet treat. Brie cheese with roasted almonds and pear: For the cheese lovers out there, know that you can still have a small slice of your favorite treat and still stay on the low-calorie side. Try a slice of 2 oz. of Brie cheese with some toasted almonds and pear slices. Hazelnut chocolate fondue: Mix 2 tbsp of natural hazelnut butter with 1/2 tsp of cocoa and a splash of almond milk and a bit of maple syrup to create a healthy chocolate syrup to dip fresh fruits in. Believe me, it’s a real delight! Mini cheese fondue: Heat 2 cups of shredded cheese with 1 1/2 tbsp flour, 3 tbsp apple juice and 1 tbsp of Dijon mustard to create a melted cheese fondue. Serve with apples chunks, steamed cauliflower, Brussel sprouts or broccoli. Nut butter and yogurt banana treat: Slice a banana in 2 lengthwise and spread some nut butter of your choice on one side. Put back the other half to make a sandwich. Add spoonful of yogurt on top and drizzle with honey or maple syrup. Dark chocolate with warm tea: Try this antioxidant punch by letting melt a square of quality dark chocolate on your tongue, with a sip of green tea. 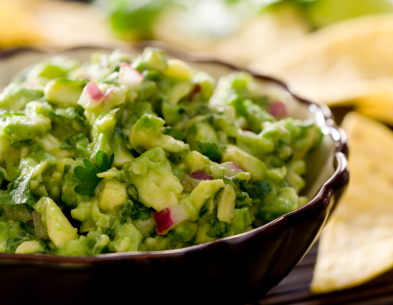 Guacamole and pita chips: Whip up a quick guacamole by mixing 1 tbsp of salsa with mashed avocado. Serve with pita chips. Dehydrated veggie chips: Dehydrating thinly sliced of zucchini or leafy greens such as kale makes surprisingly delicious healthy chips. Add your favorite seasoning before putting veggies in the dehydrator or low heat oven. Roasted chickpeas: Roasted chickpeas can make an interesting low-fat variation to mixed nuts. Their high fiber content and protein will help you to stay full longer.